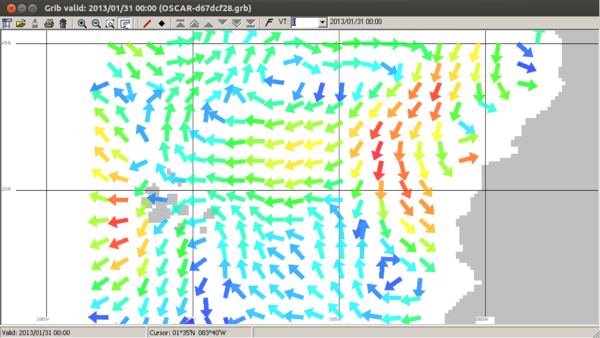 Earth and Science Research (ESR) has a world-wide simulation of Ocean Surface Currents in Real-Time (OSCAR) which has been running since 1992. They have been modifying and testing the model for many years and are currently funded by NASA (previously funded by NOAA). For people with low-band width internet access, like sailboats, accessing and using their on-line data is not easy. I setup a set of tools to convert their daily simulated results into a format called GRIB which can be viewed by many weather tools such as ViewFax (windows only, but runs under WINE on Linux). Older versions of ViewFax might not show any data -- upgrade to at least Version 5.0.56. To access this data I setup a email responder just like saildocs. OSCAR data covers much of the world from 80N to 80S, spanning the globe from 180W to 180E. The resolution is in 1/3 degree increments. The time-frame is a 5 day resolution. Once a day, usually at midnight Pacific Standard Time, the Seattle office updates their simulation of ocean surface currents. This snapshot represents their best estimation of what the ocean surface current is doing. They use a number of techniques and data sources for estimating ocean current flow. If you would like to see how their model compares to real data try reading Validation and Error Analysis of OSCAR Sea­surface Currents written in 2006. You can retrieve the data by email using the following steps. Remember these are ocean currents, so the model does not extend to the shore line and are more accurate for the open ocean. Make Latitude and Longitude Box. Wait 30-60 seconds for an email response. 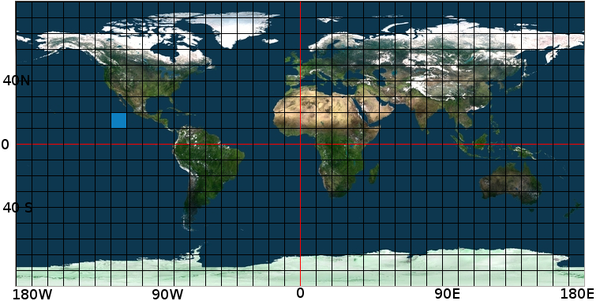 The globe is split up into grids with lines running North-South and East-West. To define a box on the earth's surface specify your latitude in degrees, say 20N and 10N. Then limit the east-west sides of the box with your latitude, for example 120W to 110W. The area is shown highlighted on this map. Now that you know your target area, send the request in the message body to "query (at) svsarana.com"
Note the subject is ignored. You will receive an email response with information about the GRIB file including it's origin. The attachment will contain the grib file for your requested area. 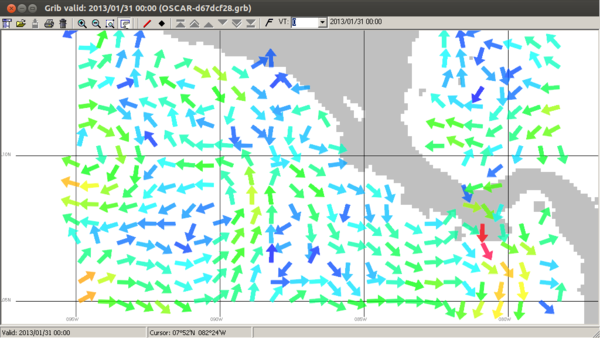 OSCAR (Ocean Surface Current Analysis Real-time) contains near-surface ocean current estimates, derived using various satellites and in situ instruments. With Airmail's email program for HF radios, you can just click on the attachment and ViewFax (version 5.0.56 or newer) will start and display the data. Otherwise, save the attachment and open your GRIB viewer. In your viewer you'll need to open the saved attachment "OSCAR-xxxxxxxx.grb" file to view it. You can mouse over the current arrows in ViewFax to get direction and speed. Here are several examples of what to expect when using OSCAR data. You'll get back a 5.2KB file that will look like the following in your viewer. The data near shore is not perfectly clipped to the shoreline but it gives you a good idea of what is happening offshore. You'll get back a 4.6KB file that will look like the following in your viewer. You'll get back a 7.6KB file that will look like the following in your viewer. 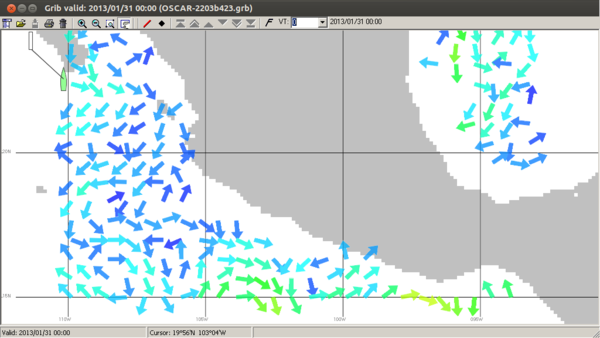 Where OSCAR really shines for sailors is in highlighting the equatorial and counter equatorial currents. For example the passage from Panama to Ecuador or the Galapagos. 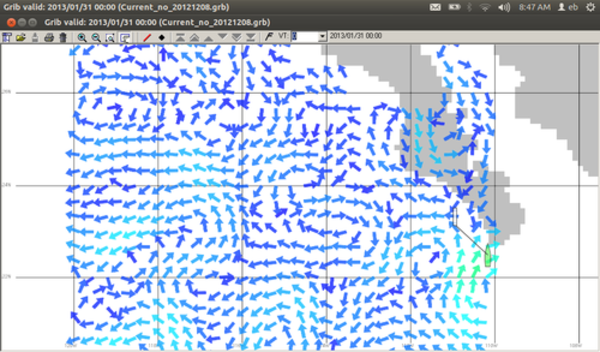 The 7.2KB file reveals areas of stronger currents. There are not many current models to compare. However NOAA has an Atlantic Model that can be fetched from "query (at) saildocs.com" NOTE this is not svsarana.com! Use the command "rtofs:lat1,lat2,lon1,lon2"
Additional information about OSCAR can be found at NOAA. Want the Best Guide Books for Central America? See our e-books that we've been working on for years. You can download them without having to wait for your mail to arrive. Our books cover more anchorages than any other book on the market. Check them out! You can also watch our massive slide show on Central America if you're not sold on the idea yet.